Note: To use Text Message Relay, you must first add a Relay Prefix to the Group you wish to message. Using your phone's message client (e.g. iMessage, Android Messages etc.) create a new text message to your Connect Rocket account phone number (ask your Account Administrator if you don't know this). 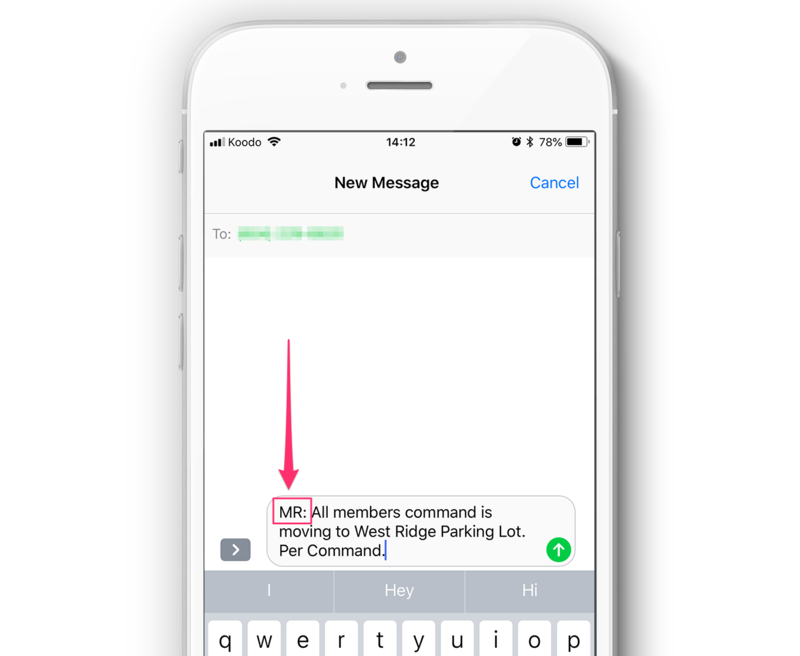 Begin composing your message using the Relay Prefix followed by a colon for the Group you want to relay your text message to. In this example, I'm messaging the Mountain Rescue Members List which has a Relay Prefix of 'MR'. Once your message is composed, you can send it as you normally would. If you do not include a colon, your message will not be relayed. Once your message is received by Connect Rocket we will try to match the Relay Prefix with one from your groups. If the 'Relay Prefix' matches, your message will be sent (relayed) to everyone in the group. Not all carriers include appropriate 'headers' in their messages which could lead to lost segments if your message exceeds 160 characters. As a general rule, keep relay messages under 160 characters.